Malem Motion Alarm manufactured by Malem is used in home care and facility care to monitor family members or patients suffering from dementia, sleepwalking, wandering, fall management or any other condition that warrants close observation. This alarm sensor utilizes a motion type sensor to detect when the patient is moving and sends a signal to an alarm unit to notify caregivers or family members. 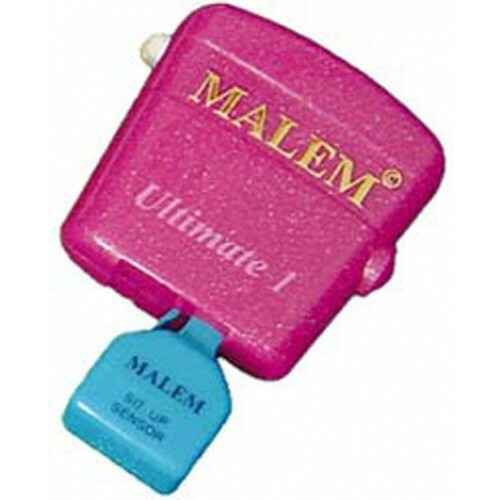 The photo at the top of this web page displays the Motion Sensor (blue colored sensor) attached to the Malem ULTIMATE Alarm (purple colored alarm case). The Malem Motion Alarm is available in three different options--a one tone alarm, an 8 tone alarm that sounds randomly or sounds one selected tone, and a recordable alarm that can sound music, tones or voice message. The recordable voice message is particularly useful for patients who need a reminder not to wander off or who sleep walk. The motion sensor plugs directly into a Malem alarm device and can be unplugged to plug in other sensor devices. The sensor uses a modular plug-in, similar to a telephone connector. Detects motion and sends signal to alarm to warn nearby family members or caregivers. Weight: less than 2 oz. Alarm Options: tone, vibration, flashing light. Malem ULTIMATE Motion Alarm Warranty: 1 year. Alarm Options: tone, recordable sound, vibration, flashing light. Malem Recordable Alarm Warranty: 1 year. Sensor Color: blue (color may vary from picture). Malem Motion Sensor Warranty: 90 days. This is a great motion sensor alarm. Now it is very easy for my grand father to call me anytime if he needs anything. Also, I get sound sleep at night without any tensions. Thanks to Motion Sensor Alarm.